Here is the story of the wonder plane of the world by the brilliant man who conceived, engineered and built it. 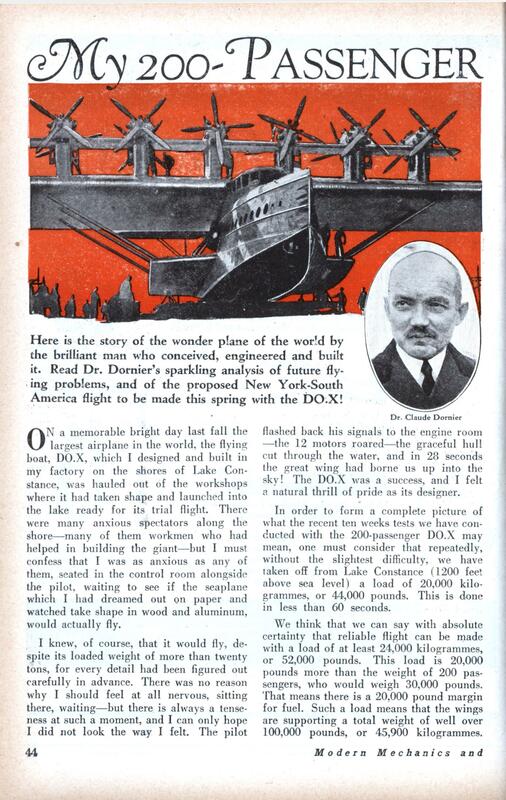 Read Dr. Dornier’s sparkling analysis of future flying problems, and of the proposed New York-South America flight to be made this spring with the DO-X! by DR. CLAUDE DORNIER Builder of largest airplane in the world. ON a memorable bright day last fall the largest airplane in the world, the flying boat, DO.X, which I designed and built in my factory on the shores of Lake Constance, was hauled out of the workshops where it had taken shape and launched into the lake ready for its trial flight. There were many anxious spectators along the shore—many of them workmen who had helped in building the giant—but I must confess that I was as anxious as any of them, seated in the control room alongside the pilot, waiting to see if the seaplane which I had dreamed out on paper and watched take shape in wood and aluminum, would actually fly. I knew, of course, that it would fly, despite its loaded weight of more than twenty tons, for every detail had been figured out carefully in advance. There was no reason why I should feel at all nervous, sitting there, waiting—but there is always a tenseness at such a moment, and I can only hope I did not look the way I felt. The pilot flashed back his signals to the engine room —the 12 motors roared—the graceful hull cut through the water, and in 28 seconds the great wing had borne us up into the sky! The DO.X was a success, and I felt a natural thrill of pride as its designer. In order to form a complete picture of what the recent ten weeks tests we have conducted with the 200-passenger DO.X may mean, one must consider that repeatedly, without the slightest difficulty, we have taken off from Lake Constance (1200 feet above sea level) a load of 20,000 kilogrammes, or 44,000 pounds. This is done in less than 60 seconds. We think that we can say with absolute certainty that reliable flight can be made with a load of at least 24,000 kilogrammes, or 52,000 pounds. This load is 20,000 pounds more than the weight of 200 passengers, who would weigh 30,000 pounds. That means there is a 20,000 pound margin for fuel. Such a load means that the wings are supporting a total weight of well over 100,000 pounds, or 45,900 kilogrammes. It is a weight equal to the average American passenger locomotive! You may wonder how we knew we could build a plane like the DO.X—so huge and so heavy. In order to form a picture of what lies back of this design one must first consider that the importance of the flying boat was first realized in England, and generally developed there. No other country can look back on so long a continuous and systematic development of building flying boats. Too, in Germany we had built many. So when we came to design a huge flying air liner, we had many good designs to depart from. To get this picture of what the DO.X is and what is behind her, I give some of the data of a large family of flying boats that were all thoroughly tried and tested. We knew we could use these loadings with success. 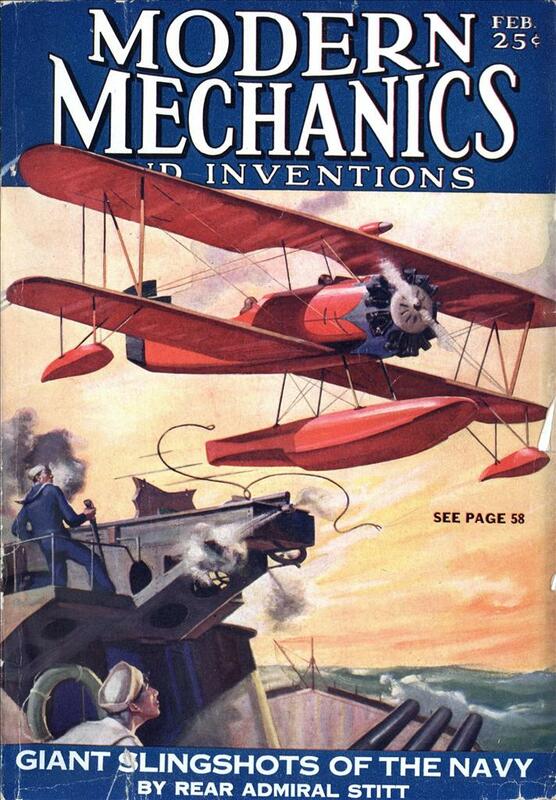 They had made other good flying boats and we knew the information would serve us accurately. By comparing the figures for the “Li-belle,” “DO.E,” “Wal” and “Superwal” types with the DO.X, we see that the DO.X is a type with a great future. These figures have proved their accuracy, now that flight tests are successful. You can see how much larger and heavier the DO.X is, yet how we managed to get the same loadings and weights per horsepower. Libelle Siemens 80 150 31 21 2. ft.
DO.E Jupiter 450 520 51 36 4.5 ft.
Wal 2 Jupiters 900 950 67 54 5.3 ft.
Superwal 4 do. 2000 1480 84 72 7.5 ft.
DO-X 12 Jupiters 6000 4670 164 120 18.9 ft.
1. It is desired to cover a course of 600 miles with 50 per cent fuel reserve and complete equipment for mooring navigation and special purpose. What paying load can be carried? With 50 per cent reserve tire point at 1200 miles is taken and we find that Libelle, DO.E and Wal are too small for the purpose. Superwal gives a surplus load of 4500 pounds while DO.X gives a surplus of 28,800 pounds. In other words, Libelle, Wal and DO.E can carry no paying load under these conditions, while Superwal can carry 19 passengers and DO.X 120 passengers, allowing 144 pounds for the average weight of each passenger. 2. A paying load of 6600 pounds has to Le carried 1500 miles with 40 per cent fuel reserve. Taking the 1800 mile point, a paying load of 6600 pounds is obtained for DO.X while the other boats fall short of this requirement. Besides the question of carrying capacity, speed and radius of action, it is of special importance to form some view of the sea- worthiness of each boat. Seaworthiness is not a simple thing to define, and it is not at all clear what qualities are desirable. For the present and, it would seem, for a long time to come, most experts would think it rash to lay down precise requirements. As a personal opinion, the seaplane must be able to fly and to meet prescribed civil or military requirements. It must be able, with full equipment, instruments and crew, tee carry prescribed loads to a given place in a given time (with reasonable latitude). This implies ability to start under normal conditions. Next in importance is the ability to make a forced landing, with skilful handling, and to ride all day in a sea of from 52 feet to 18 feet. Starting under such abnormal circumstances is not necessary and not worth striving after, taking a sea exceeding 12 to 16 feet as abnormal. The reason for this opinion is that the materials of construction available at present do not afford the means of building flying boats in a rational way, strong enough to get off in a heavy sea without risk. To meet such requirements the useful load and range would be so heavily reduced that such flying boats would answer no civil or military purpose and would therefore be practically worthless. It is difficult to meet the one-sided demands of sea pilots for continuously increasing seaworthiness in view of the tare weight imposed by economic considerations, yet increase of size opens prospects of removing more or less completely the causes which very often lead to damage in a sea. This refers especially to the frequent damage to running airscrews by waves. It is easy to see the advantage of the DO.X in this respect, with its airscrews 18.9 feet above the waterline. This is equally important for the engines. In the 1926 seaplane meeting at Warnemunde a DO.E type flying boat was taking part in competitions when a wave broke over the engine, filled the carburetor with water and put the engine out of action, just when full power was required for getting off. In the DO.X type pilots and mechanics are increasingly safe from seas washing over their positions. At the same time, comfort, endurance and ability to carry out repairs in rough weather are all increased. These figures, admittedly, enable us to form no final judgment as to the economic value of the new type. I will have to wait until the DO.X is used in the regular air traffic before I will really be in a position to say that the ton-kilometer costs so-and-so much with DO.X. Then I will be able to compare her with other airplane types and decide whether DO.X comes up to the expectations I have of her from the economic point of view. But one must have time for all this. For the moment we must be satisfied with the great engineering success—and hope for the best. At the moment we are carrying out tests with crude oil engines at the wharf at Friedrichshafen. If the results are good— the fuel consumption of the Diesel-crude-oil-aeroplane-engine only amounts to 3.9 pounds per h.p. hour—the DO.X, equipped with engines of this kind, would have a radius of action of about 3600 miles. That is all I have to say about the future!